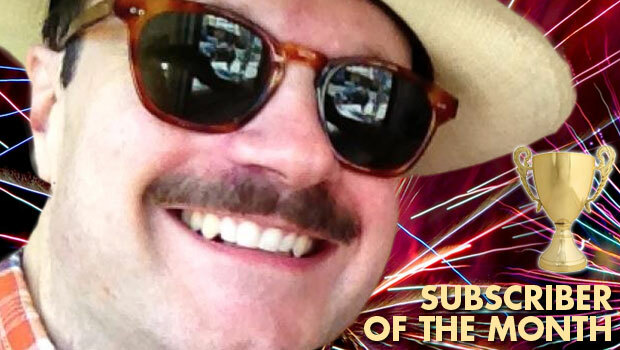 Michael Gerber, you're the first�big time celebrity hotshot�to become a Devastator Subscriber of the Month! How does that make you feel? Headachy, nauseous, trouble concentrating - and there's a slight ringing in my left ear. Usually it's both ears, so I'm really encouraging people to subscribe, for the health benefits. You wrote the hilarious, bestselling Barry Trotter series of parody books. Have you ever met JK Rowling? If yes, what was that like? If not, what would you say to her if you did? I never did meet Ms Rowling, or as I like to call her, "thanks for not making my life a hell." I heard through channels that she enjoyed the parodies; I hoped that she would, because I was one of the few people who really loved Harry Potter. They're great books, you ought to read them, shame they haven't gotten more publicity. Anyway, she sneaked little Barry Trotter shout-outs into the later books; I like to think that I am a teensy bit responsible for making the elder Weasley twins significantly more batshit. It's a nice legacy. We hear you're�working on launching a brand new humor magazine! Tell us about it, so we can analyze the project for potential competitive weaknesses-- er, I mean... Just curious! Well, its primary competitive weakness is "being a humor magazine." It's going to be a quarterly in large trade paperback format, with a website featuring more timely material. I'm tweaking issue #1 and we've got George Meyer, Jack Handey, Brian McConnachie, Roz Chast, and many, many other Simpsons, New Yorker, SNL people, with some younger folks thrown in there, too. Our hope is to create a permanent paid market for classic forms of funny prose, cartooning and illustration, so that those arts can survive until the big corporations finish flipping out. We'll be Kickstarting in the fall, with a campaign specially tailored towards people looking to launder a serious amount of drug money. What's your favorite Devastator comic or article of all the times? I make no claims for these two being the funniest things you guys have run, only that they hit a couple of my personal sweet-spots: I loved David Malki ! 's steampunk Inspector Gadget in #1, and Rat Nights of Rat Hollow in #5. As a member of the Atari 2600 generation I suspect I am missing a lot of jokes per issue. I keep hoping you'll parody "B1 - Keep on the Borderlands." This is your megaphone to all your fellow Devastator subscribers out there. What would you like to say to everybody? I'm serious, those Harry Potter books are really good. They might be a little hard to find, but keep�looking. You'll be glad you did. Want to become Subscriber of the Month? Leave a comment below�and tell us why! Not yet a subscriber? What're you waiting for? !�Subscribe for 4 issues today�and get a free "thank you" gift!